Find the right tour for you through Obidos. We've got 52 tours going to Obidos, starting from just 3 days in length, and the longest tour is 39 days. The most popular month to go is September, which has the most number of tour departures. "The variety of experiences and opportunities was excellent. The tour director was..."
"Portugal is a jewel.... Biking the Atlantic Coast from Porto to Lisbon was the perfect..."
"The guide could have described what we were seeing as we drove in the mini-van for..."
"First I would like to compliment our Tour Guide John Shaw on the way he dealt with..."
"42 people on one bus is far too many. The bus is too huge and the back stairs too..."
"It was a good and comprehensive tour. 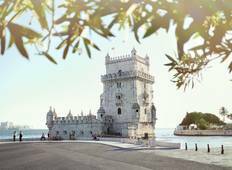 I would have liked to have a tour of Madrid..."
"Quivertree Expeditions designed a three week Portugal tour for us that included seeing..."
"Our trip to Portugal was amazing. The hotel locations were excellent, optional tours..."
"I would recommend this tour to anyone. While the biking was a challenge at times..."